Students can invite anyone with and email account to view their grades, financial aid, and/or balance information. For example, students can invite parents to view grades, billing information and charges, and well as financial aid information. Enter your email and the password provided. Once you have logged in you will have access to any information the student has shared with you. Note that you may not have access to grades, balance, and financial aid. Students can share one all of these items and can revoke rights to them at any time. Click on balance if you wish to see charges, payments, and balance information. Click on Grades to see grades, gpa, and classes taken. 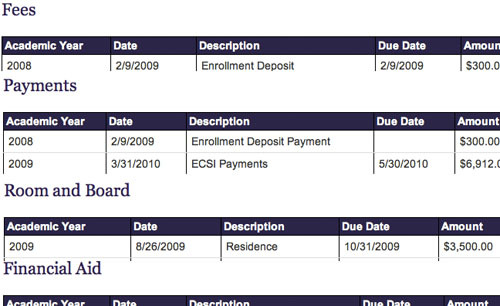 Below is an example of what the billing page would look like. If you have forgotten your password you can use the "Forgot your password" link on the login page. Enter your email address and a new password will be mailed to you.